Thank you for this recipe. It came exactly like the picture. I’m making it again tonight for New Year’s Eve family get together. 7 pies. You are more than welcome Timothy! This is a family favorite in our house! My 7 children devour 3 pies for 1 meal! Incredible! So quick and easy though that the kids love to help make them! Hope your NYE party was a success! Thank you for a great recipe. I utilize plain greek yogurt in replace of sour cream for most recipes. I tried it with this and was just as delicious as sour cream, with less fat and more protein. I’m so glad you enjoyed this recipe! I never thought of using greek yogurt! What a great idea! Who wouldn’t want less fat and more protein, right? Thanks for the tip! I’ll have to try it that way next time I make it. I’m in australia, what are cresent rolls? Thanks! Hey Sarah! I just googled it and in Australia crescent rolls are equivalent to croissants. We find our crescent rolls in the refrigerated section of our supermarket near the eggs and dairy…that is where it said for you to check in your Australian supermarkets as well. If you still can’t find them please let me know. I have a client in Australia…I can ask her where to find them as well. Thanks so much for posting! 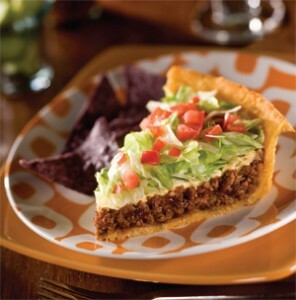 Be sure to let me know how your taco pie turns out! It is a family favorite here…so easy! Enjoy! I’m going to try your recipe tonight! I bet it’s going to turn out fantastic!!!!! thanks for the thought of sharing it with the world!!!!! It was absolutely delicious!!!!!!!!!!!! !Thanks again for the recipe!!!!!!! I’m not to sure about the heated sour cream? Hey Velda…Yeah, I would have to agree with you. I don’t think the taco effect would be the same with a mashed potato crust. I prefer the crescent roll crust. A different filling might taste great in a mashed potato crust though…something like a chicken or beef pot pie filling. Now that sounds tasty! Thanks for your comment! I made this tonight for dinner and I cant say it enough..We love , love, LOVE this! Thank you! I will be making it again next week! Awww…I am thrilled your family likes it so much! I will be adding tons of new recipes when I am finished revamping my site! Be sure to stop back! Thanks Ashley! Loved the recipe ! Substituted fresh salsa for tomatoes ! Really good if you like a little more bite ! Hey Maureeen! Thanks for stopping by! I’m so happy you enjoyed the recipe! Salsa sounds amazing…I’m going to have to try that next time I make this. I bet my kids will love it! Made it again tonight and after putting the taco beef in the pan I added some taco sauce ! Awesome ! Look at you go, girl! Ok, now you have to make it again and this time use your favorite flavor of Doritos in the bottom instead of regular corn chips! I really changes the flavor. Let me know what you think! Do you think short crust pastry will work? I’m from Australia and that’s all I have and don’t want to go to the shop haha! We had this tonight. Absolutely amazing. I tweeked it a little. Put half can of refried beans on top of crust then the chips and the rest of the ingredients. Salsa on top of lettuce & tomato. Thanks for sharing! Are your crescent rolls baked or unbaked? I saw your reply to another Aussie about them being similar to croissants, I have found frozen unbaked croissants in our supermarket as well as the usual baked ones in the bakery. Yes, you can purchase the crescent rolls in cans, unroll the dough, and then press each individual crescent roll piece into the bottom of your pie pan. So glad you enjoyed the recipe! We have raw crescent roll dough here in the States that comes in cardboard tubes. You peel back the outside wrapper and then press on the tube and it pops open and the dough comes out already perforated into triangle shapes. Then we roll them and shape them like crescents and bake them off. This raw dough is what you want to look for. I’m from Australia and it sounds like the cresent rolls would be exactly the same as our puff pastry. Both are made by rolling and folding pastry with butter. I made a variation on this pie last night (using puff pastry) and it was AMAZING. Hey Trudi! I am so glad you liked it! This is one of our family favorites too. I’m going to have to try it with puff pastry the next time I make it and see how it turns out. That sounds delicious! Thanks for commenting! I am so glad you and your dad liked it! This is definitely a go-to meal in our busy house. Thanks for stopping by.